I first discovered Ozric Tentacles in 2009. Their heady mix of modern and psychedelic styles is a popular draw on the live circuit, and their vast back catalog is full of groves that appeal to both the jam-band scene and more progressively-minded listeners. 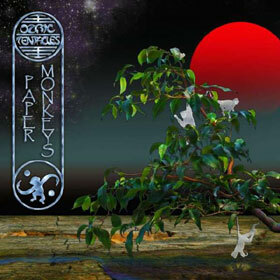 The band’s latest studio album Paper Monkeys continues to serve up the sort of sounds that have endeared them to their loyal fan base, while expanding their audience. I spoke with leader Ed Wynne about the band’s music. 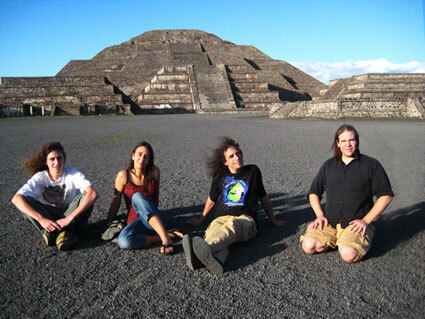 Bill Kopp: Occasionally the music of Ozric Tentacles uses vocals, but as an instrument – for texture – rather than as a means to deliver lyrics. Since the songs don’t have lyrics, are the “about” anything? Put another way, beyond the music itself, when you’re putting sons together, do you do so with a theme or extra-musical idea as a basis? Ed Wynne: When a song is starting, it’s often kicked off by the fact that I’ll wake up in the morning and switch the keyboard on: “Oh, it sounds like that today!” But the tracks don’t have much of a concept at that point; they’re bare-bones. Now, occasionally I’ll wake up with an idea, and run down there to put it down. But generally, things seem to develop on their own. The tracks come into focus. BK: Have you ever been tempted to add lyrics to the music? EW: I’ve never actually thought to do it. I’m not the greatest singer in the world [laughs]. In general, I have always preferred instrumental music, really. Because it doesn’t specify how [the listener] is supposed to feel. When there aren’t lyrics, people interpret it their own way. Lyrics tend to tie it down a little bit. And also, for people who don’t speak English, they’d have to use one of those translating machines to see what we’re on about! BK: While Ozric Tentacles’ music is certainly high-energy and often trance-inducing, the one act that often comes to mind when I listen to you is Jean-Luc Ponty, especially his early-to-mid 1970s work. Have you listened to that at all, and would you agree that there’s a bit of a similarity in the vibe? EW: Yeah, yeah, yeah: very much so. I’ve always really loved what he does. I love his violin playing, but I also really love the way he can construct a tune. Pretty potent, really. BK: How do the songs develop: out of studio/rehearsal jams, out of what happens onstage, or are they at least initially based on a groove, texture or musical idea? EW: All of the above, really. Every song is a different story. There are three kinds of stories. One is – as I mentioned – where I wake up with an idea for an intro, something that’s in an ethereal Ozrics style. And then, other times, yes: we’ll be jamming and we’ll come roaring into a riff. And I’ll have the recorder on to capture it. We have quite a nice studio at the moment. It has a drum door, so we can close it to keep from getting too loud. That means that we are free to jam. And the third way is to sit there and try to work something up. BK: I saw the band back in summer of 2009 here in Asheville. When I was researching to write the post-show feature, I found that you’ve sold more than a million albums worldwide despite never having major label backing. I was amused when whomever edited the band’s Wikipedia entry cited me as the source for that info. At this late date I have no idea where I even got the information from! But it is true, right? EW: I remember that show, at the Orange Peel. That was a good one; a lot of fun. But yeah, it’s true. We’ve been doing this for quite a while now: twenty years or so. So that million wasn’t all in one go. They’ve been selling gradually more over the years. It’s nice to know. BK: One of the observations I made in that feature was that – from my point of view, anyway, your music does something that very little music does. It bridges the often large gap between fans of jam-band and trance music with people who like progressive rock and even jazz. Do you think that’s a fair assessment? And if so, would you say that’s part of your musical goal, or is it more of just a byproduct of you doing what you do and having people dig it? EW: It’s a compliment. Thank you. We try and bring things together. Also, there’s the techno crowd, y’know. The ravers. They quite enjoyed us there for awhile, because we have weird noises and do some stuff on the synth. As many different people as can come together is a good thing. It’s quite amusing at a concert, sometimes. You’ve got the noodle dancers up front and the prog rockers at the back. BK: Yes! And those of us in the back, we’re wearing black t-shirts and we’ve got our arms crossed. But we’re digging it. BK: Including the early cassette releases, the band has roughly twenty-five albums. Do you think your music has changed over time? How would you compare and contrast your contemporary stuff with the approach of your earlier material? So we were limited by the amount of overdubs we could do. But how it’s changed…hard for me to say, because I’m right in the middle of it. We’re more world-y, more ethnic now. It’s changed a bit, but not that much. BK: The title track on Paper Monkeys rock really hard, and is more straightforward – less groove-orientated – than a lot of the band’s material. It reminds me a bit of Joe Satriani. EW: That “Paper Monkeys” track was fun. I hadn’t done one of those heavy guitar-y ones in awhile. It was really fun to do, and it’s great to play that one live. Not easy, though: the beginning and the end are quite easy. But the middle is crazy. Pretty quick bass line there; Brandi [Wynne] has to work hard. BK: I believe that the Asheville date in 2009 was unusual: to my knowledge you don’t come around this region all that much. Any chance we’ll see you back in Asheville? You went over really, really well last time. EW: I think so. There’s a clutch of American dates, with more to be announced.